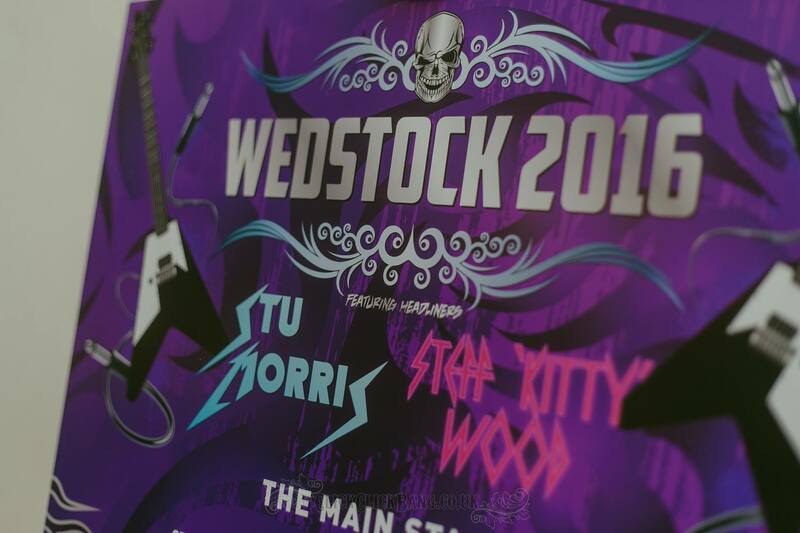 Kitty & Stu’s Heavy Metal Wedstock Wedding – Way back at the start of 2016 (yes hard to believe we are half way through) we got an email from an awesome photographer called Kitty Wood (http://kittywoodphotography.tumblr.com/) looking for us to create some purple and silver heavy metal themed wedding invitations and wedding stationery for her forthcoming wedding. 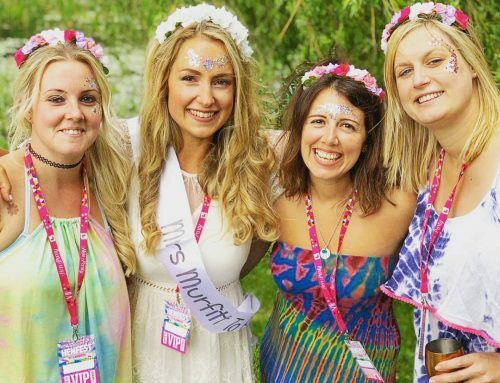 Kitty welcome to Wedfest! as you have come to exactly the right place. 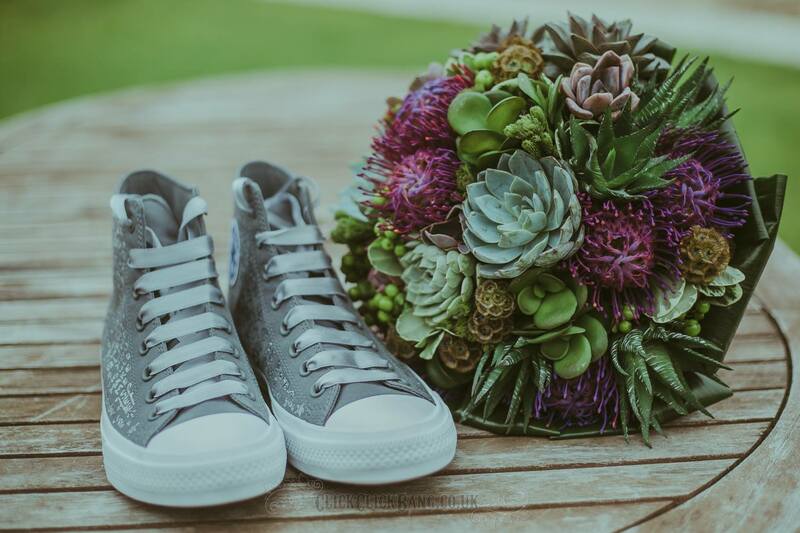 All photos on this page are by the couples amazing wedding photographer ClickClickBang Photography, check them out by clicking on the link. 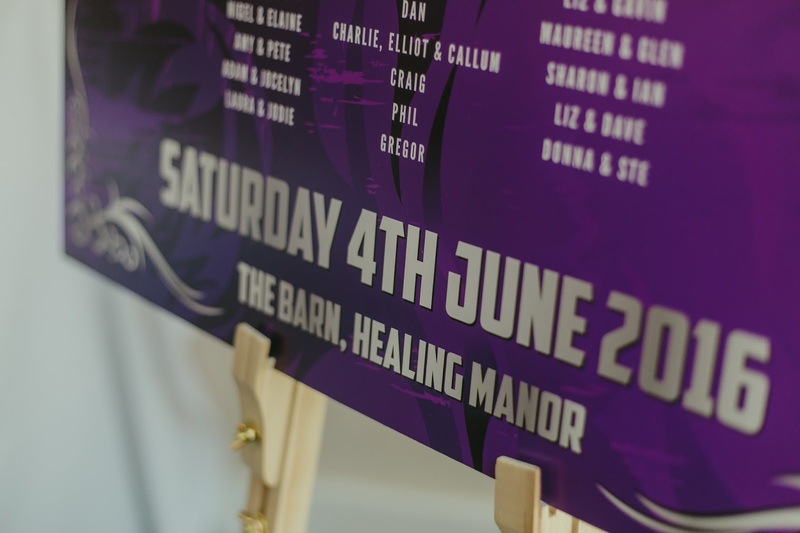 Kitty and Stu were got married at the start of June at The Barn at The Healing Manor Hotel. 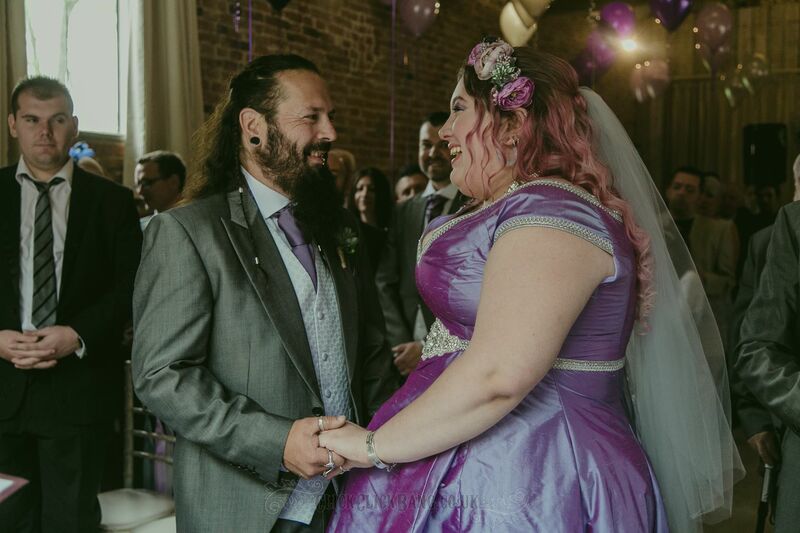 The first thing Kitty told us was that the colour scheme was going to be Silver and Purple and she wanted the designs to reflect a heavy metal vibe. 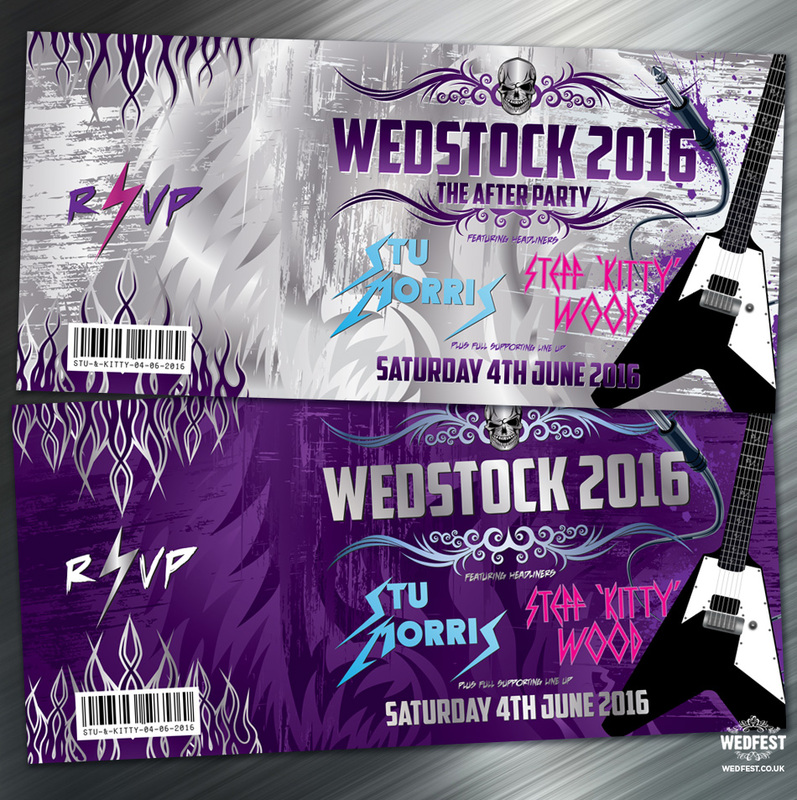 They also wanted to name their wedding day WEDSTOCK 2016. 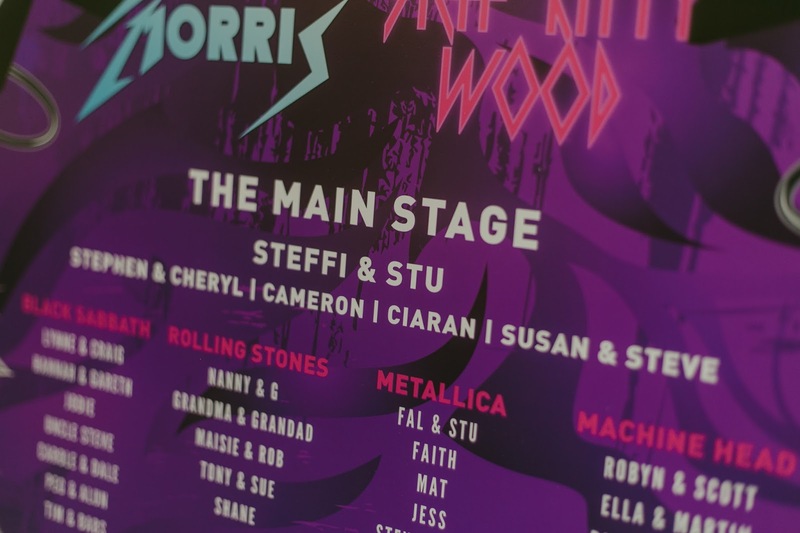 So we put on a bit of Metallica, turned it up to 11 and set to work on Kitty and Stu’s heavy metal wedding invitations. The results as you can see below turned out pretty hard rockin’! 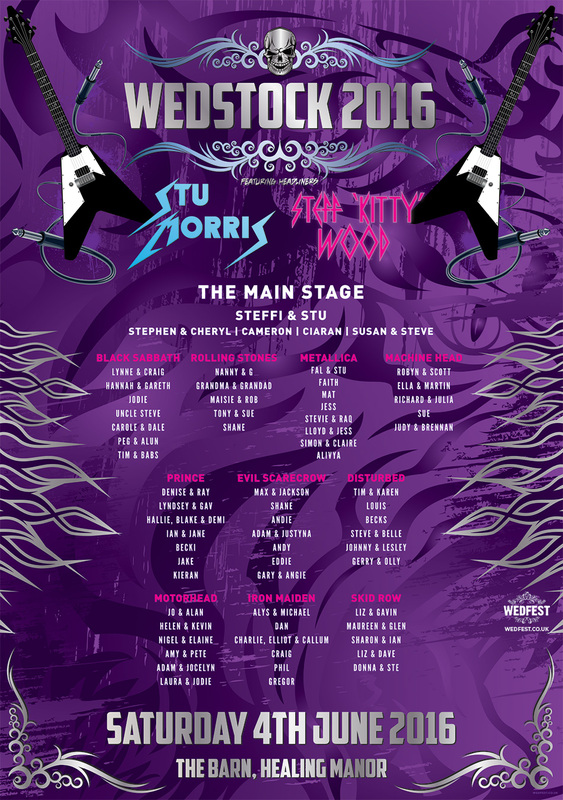 The invites feature all things rock and roll from guitars, skulls, lightening bolts and flames! 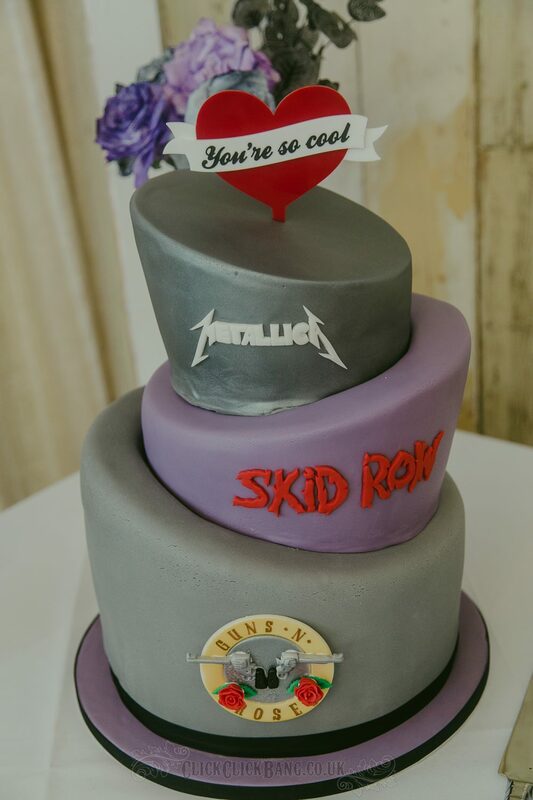 These wedding invitations say get ready to party, because this wedding is going to rock out! 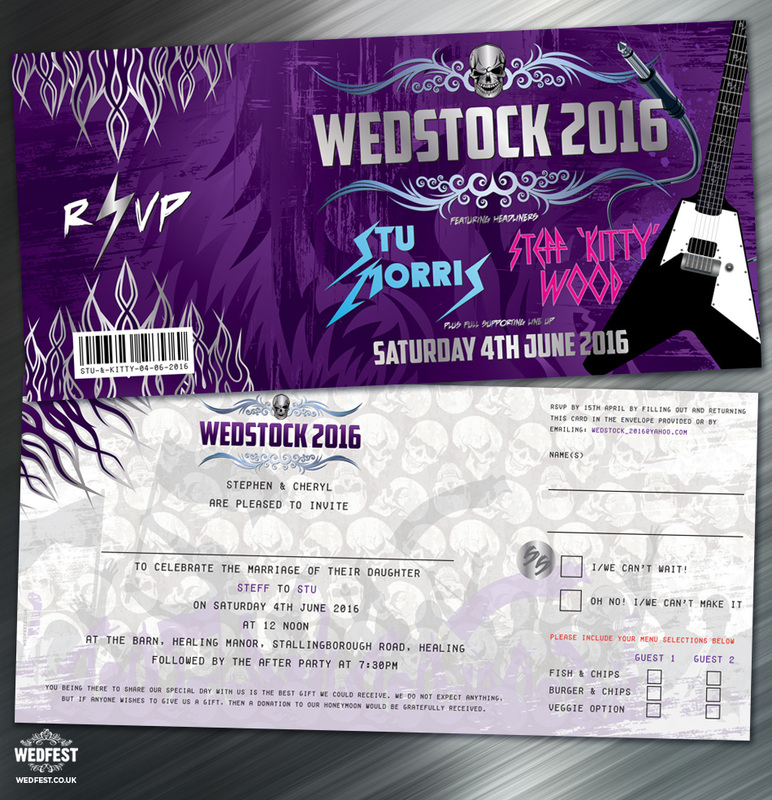 The reverse side of the invites feature all the main details of the wedding and the RSVP stub was perforated like a ticket stub so that the guests could easily tear it off, fill out their wedding menu choices and send it back to the couple in a pre addressed envelope. For the wedding evening invitations we reversed the colours so that the silver colour was the main background colour and the purple was used in the text and accents of the design. 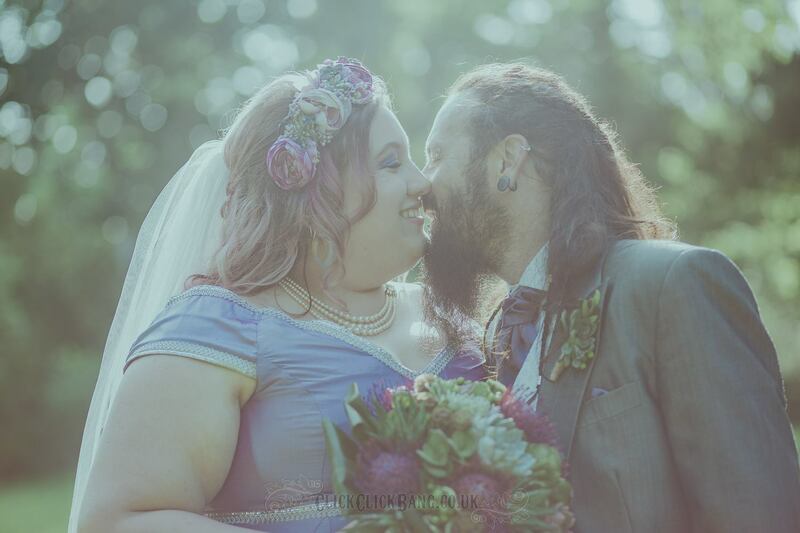 As you can see together it looks like an awesome set of wedding invitations. The couples day itself was as rock and roll as you can imagine. 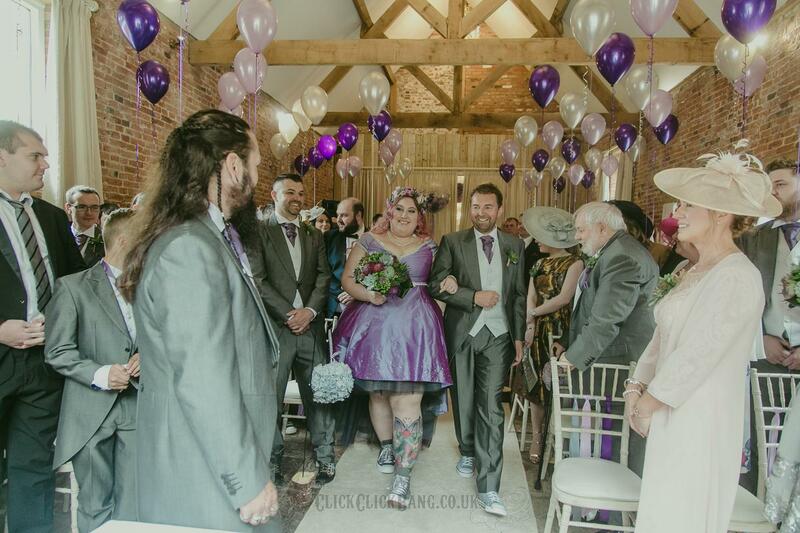 Kitty the Rock n Roll Bride wore an amazing purple wedding dress cut to above the knee which showed of her awesome leg tattoo. 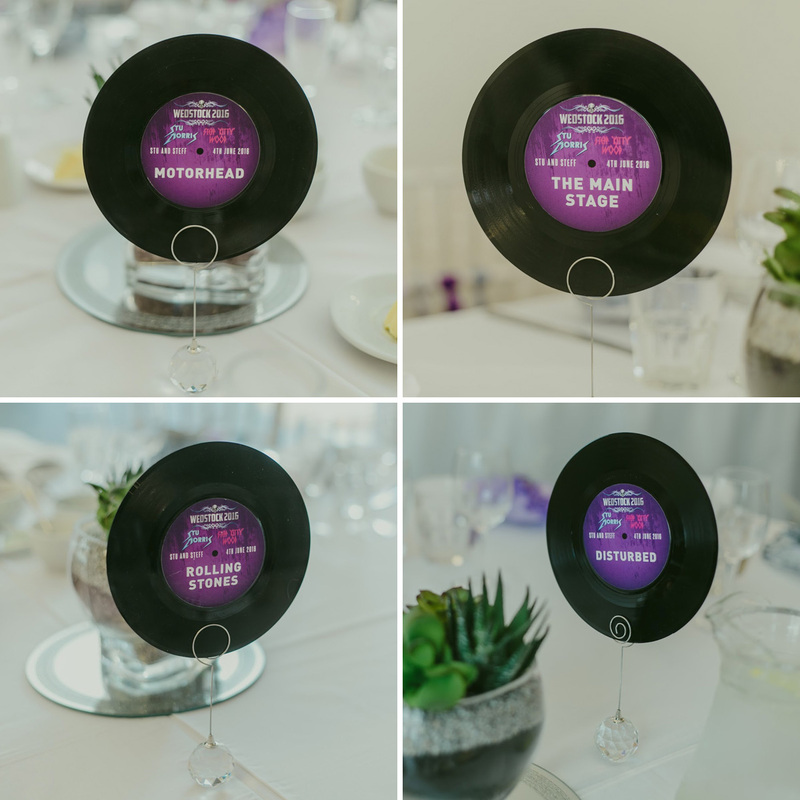 Stu and the men wore silver suits with purple ties and the room and wedding decor was filled with purple and silver balloons. 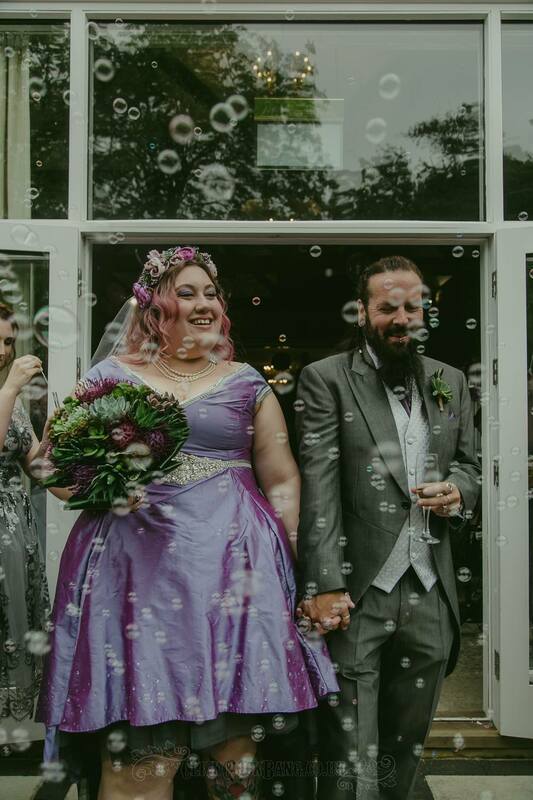 You just have to have a look at the photos to see how cool this wedding was. 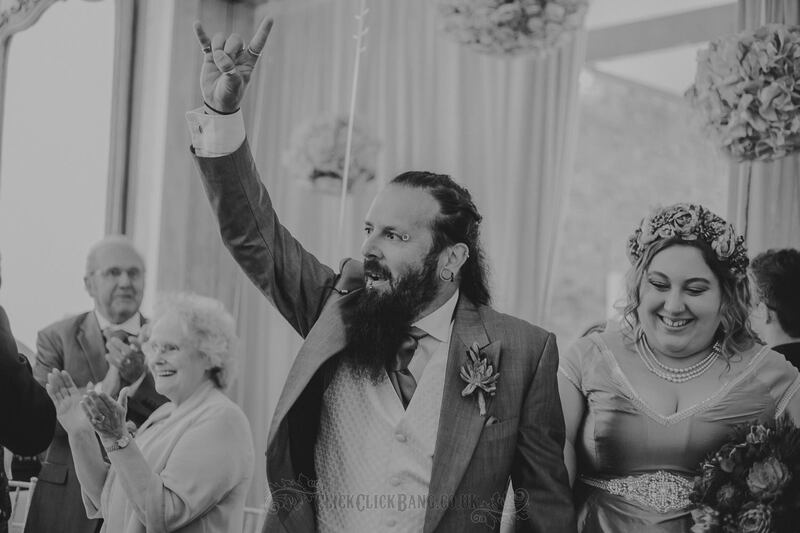 For the wedding reception we made the couple a heavy metal themed wedding table plan which featured all the couples favourite bands as the table names such as Metallica, Motorhead and Machine Head to name a few. 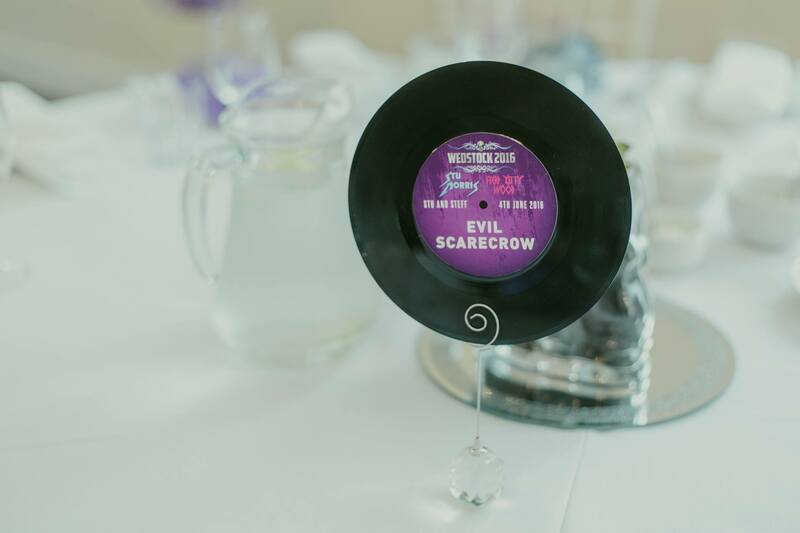 For each of the wedding tables we made vinyl record wedding table names to tie the whole hard rocking extravaganza together. 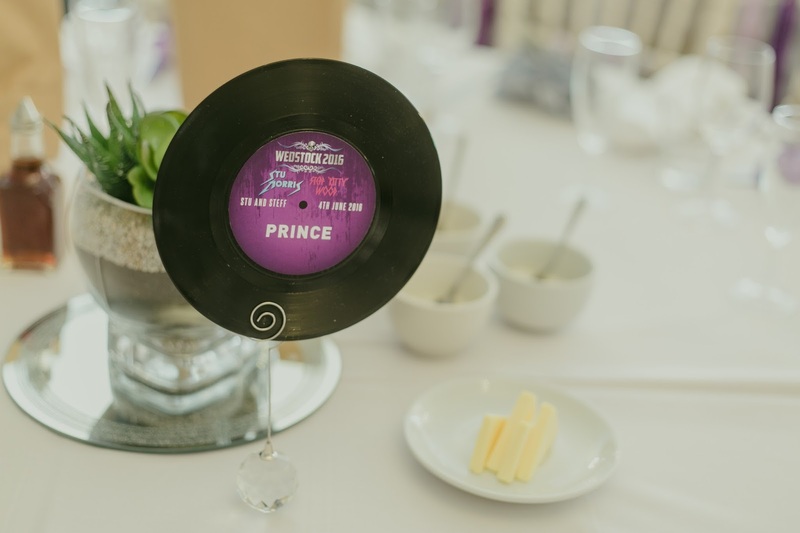 This was an amazing wedding and we at Wedfest were so happy to design the wedding stationery for it. 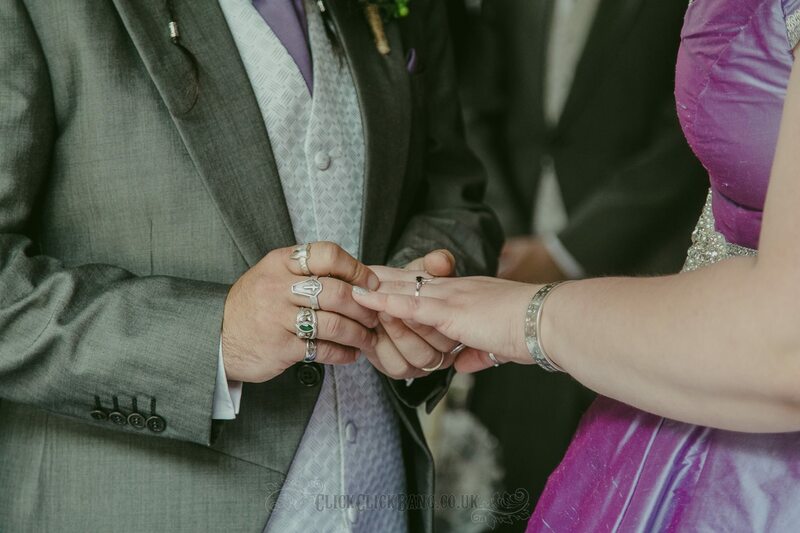 These photos are just a snippet of the overall wedding, if you would like to check out more visit the wedding photographer ClickClickBang Photography’s facebook page by clicking here and visit their website by visiting the link at the top of the page. 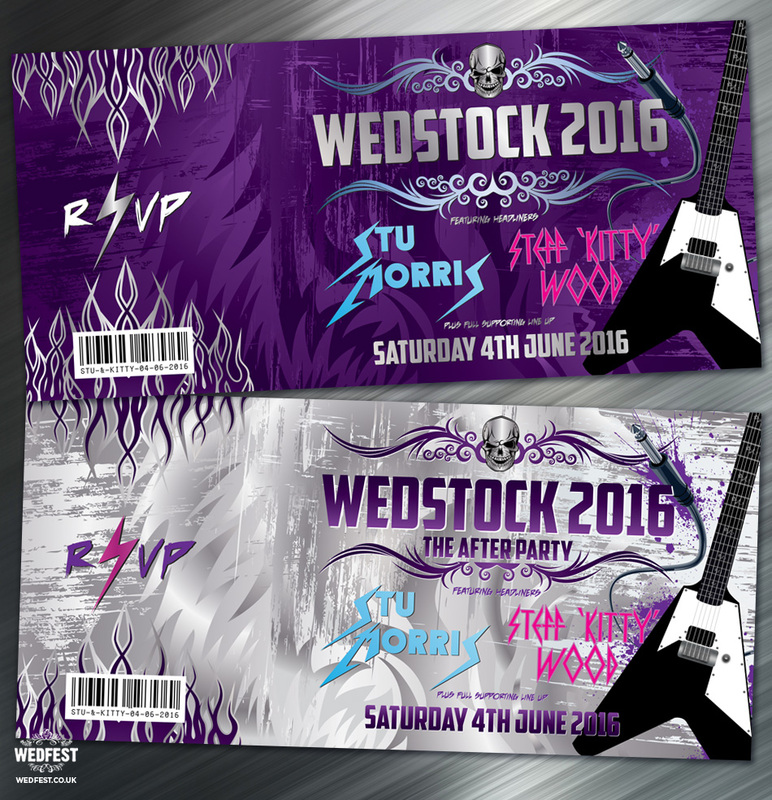 If you like the look of the wedding stationery we made for Kitty & Stu and are planning a heavy metal or rock and roll wedding and would like more information on how we can create you some rockin’ wedding stationery please click here to get in touch.